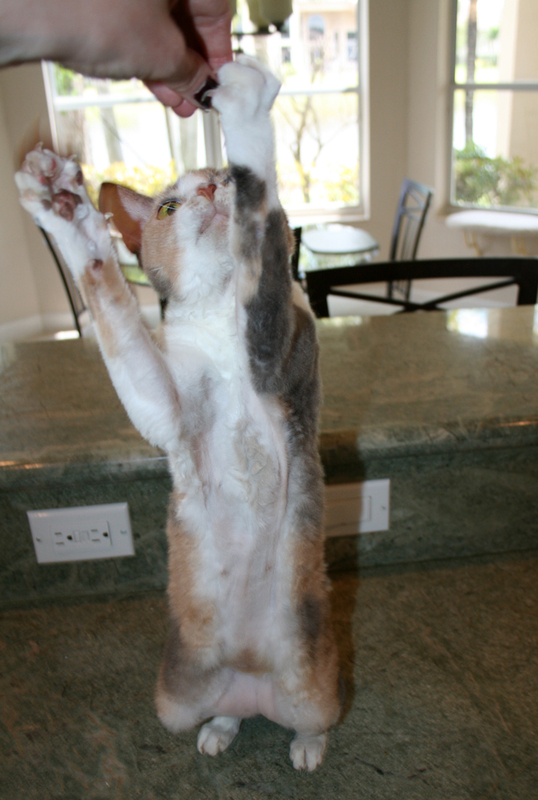 The bad thing about treats is they always seem to be just out of my reach! 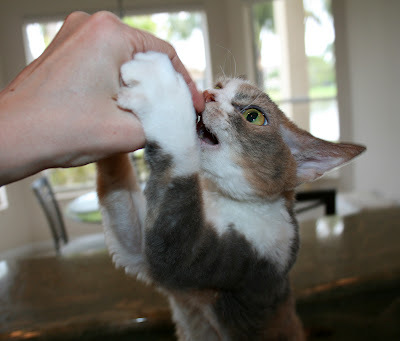 Usually I just try to gently raise my paw, and lots of times that works to bring the hand to my mouth. Sometimes I have to stretch myself a little bit taller. 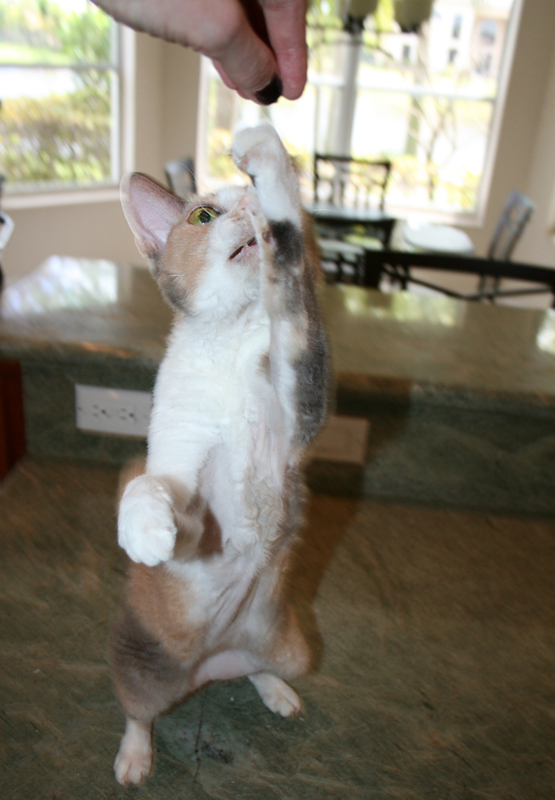 And if I really can't reach, I can stand on my hind legs like a dancing bear to get the treats. Once the hand gets in my mouth, I have learned to hold on tightly so it doesn't disappear. Sometimes I must use my teeth. But only in an emergency. When my human is doling out the treats, Binga practically bites her finger off! Do Dancing Bears have many emergencies? Do you suppose the emergency ratio would be the same for Dancing Daisy? Can Harley Hula? I don't have to work for my treats. My mom just adds them in with my supper. Spunky doesn't usually get any though because she has such a sensitive stomach. You have the treat retrieval technique mastered. You work hard to get those treats, Daisy. Good job Daisy. Glad you got that treat. Take care. I'd give her a treat anytime!! Daisy, you have it worked out purrfectly. MY mom would have handed the treat over with that gently lifted paw. Awww sweetie you'll ALWAYS get treats 'cause you're so SWEET! Looks like today might have been an emergency. MOL! Have a great Thursday, Daisy! That's a great step-by-step lesson in treat grabbing. We'll have to save that for future reference. I'm going to share your tutorial with Orange Crush (aka Waffles) ... Glogirly will appreciate it. You are nicer than I am. I would never work that hard for a treat. It looks like you have a great technique, Daisy! That's the same technique that Moosey uses, Daisy. Great job! 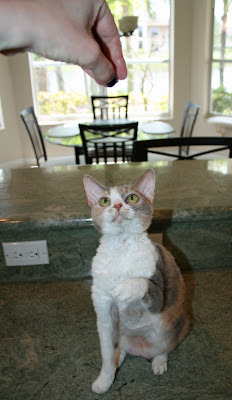 We don't think kitties should have to work so hard for their treats, do you? You are an excellent treat getter! You have good balance! 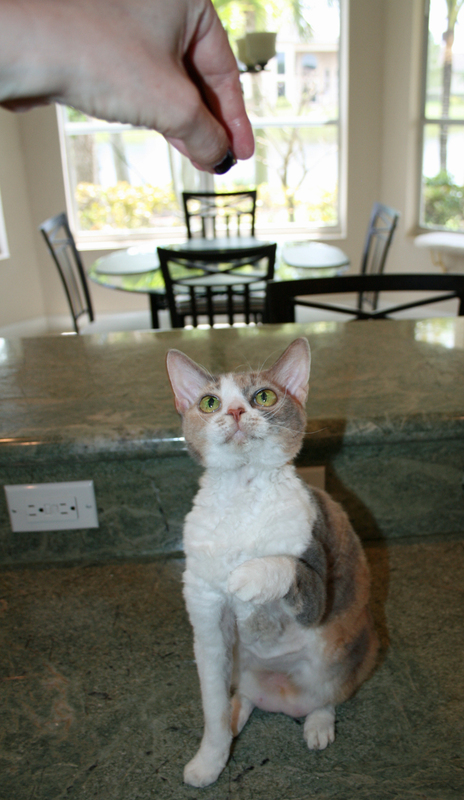 When I stand on my back legs like that, we call it "prairie dog." It is one of my most advanced moves. I no how it is Daisy ! Mes wont does ANYTHING for treats! If Mommy will not gives them too me, me walks away and ignores her forever! Same with Daddy!. However, Kozmo is a treat monster! All mommy has to does is shake the bag and like the cats in TV, he comes running!